← Akron…FINALLY! – Running for a cure! I finished in 4:07… a bit slower than I wanted but I was all gung-ho and started too fast for the first 15, got dehydrated and struggled for the next 5, and had to walk jog the last 6 miles. Then on Sunday I ran another 18 miles on really tired legs…crazy training! Then I took a nap…a long nap! Next up…Oil Creek 100 on October 11th! 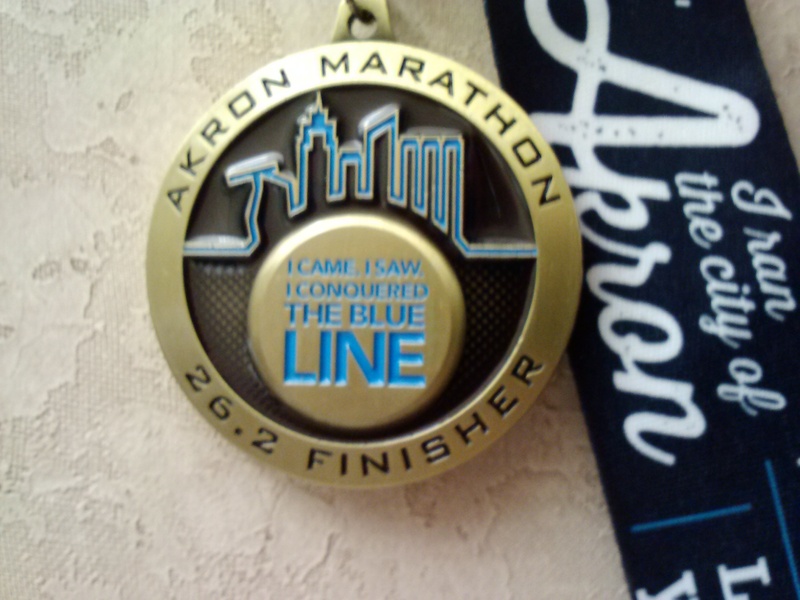 One thing that makes the Akron Marathon interesting is the blue line that is actually painted on the road and traces the marathon course throughout the city. When you are running, all you need to do is follow that blue line…and I kept thinking that we need a blue line…we need to draw the line on cancer! We are adding Mary Ann Weir, friend of Sandy Gill, to our honoree list. Mary Ann has Multiple Myeloma which is a difficult blood cancer that begins in the bone marrow and affects multiple sites in the body. There have been many successes in treatment research for blood cancers with survival rates for many blood cancer patients having doubled, tripled and even quadrupled since 1960. To date, LLS has invested more than $1 billion in research to advance therapies and save lives. If you have someone you love with cancer or lost to cancer, I would be honored to run for them. Send me their name and their story and we will add them to our list. They keep me going when the miles get tough! Thanks to donors Sean Thomas and the Employees at Axis Engineering and friend Dan Robertson for their generous donations this week! Thank you so much! Help us reach our $10,000 fundraising goal so we can continue to fund cancer research…to make a difference…a world without cancer!